Direction is something we humans are pretty accustomed to. Living in our friendly terrestrial environment, we are used to seeing things in term of up and down, left and right, forwards or backwards. And to us, our frame of reference is fixed and doesn’t change, unless we move or are in the process of moving. But when it comes to cosmology, things get a little more complicated. For a long time now, cosmologists have held the belief that the universe is homogeneous and isotropic – i.e. fundamentally the same in all directions. In this sense, there is no such thing as “up” or “down” when it comes to space, only points of reference that are entirely relative. And thanks to a new study by researchers from the University College London, that view has been shown to be correct. For the sake of their study, titled “How isotropic is the Universe?“, the research team used survey data of the Cosmic Microwave Background (CMB) – the thermal radiation left over from the Big Bang. This data was obtained by the ESA’s Planck spacecraft between 2009 and 2013. The team then analyzed it using a supercomputer to determine if there were any polarization patterns that would indicate if space has a “preferred direction” of expansion. The purpose of this test was to see if one of the basic assumptions that underlies the most widely-accepted cosmological model is in fact correct. The first of these assumptions is that the Universe was created by the Big Bang, which is based on the discovery that the Universe is in a state of expansion, and the discovery of the Cosmic Microwave Background. The second assumption is that space is homogenous and istropic, meaning that there are no major differences in the distribution of matter over large scales. This belief, which is also known as the Cosmological Principle, is based partly on the Copernican Principle (which states that Earth has no special place in the Universe) and Einstein’s Theory of Relativity – which demonstrated that the measurement of inertia in any system is relative to the observer. This theory has always had its limitations, as matter is clearly not evenly distributed at smaller scales (i.e. star systems, galaxies, galaxy clusters, etc.). However, cosmologists have argued around this by saying that fluctuation on the small scale are due to quantum fluctuations that occurred in the early Universe, and that the large-scale structure is one of homogeneity. By looking for fluctuations in the oldest light in the Universe, scientists have been attempting to determine if this is in fact correct. In the past thirty years, these kinds of measurements have been performed by multiple missions, such as the Cosmic Background Explorer (COBE) mission, the Wilkinson Microwave Anisotropy Probe (WMAP), and the Planck spacecraft. For the sake of their study, the UCL research team – led by Daniela Saadeh and Stephen Feeney – looked at things a little differently. 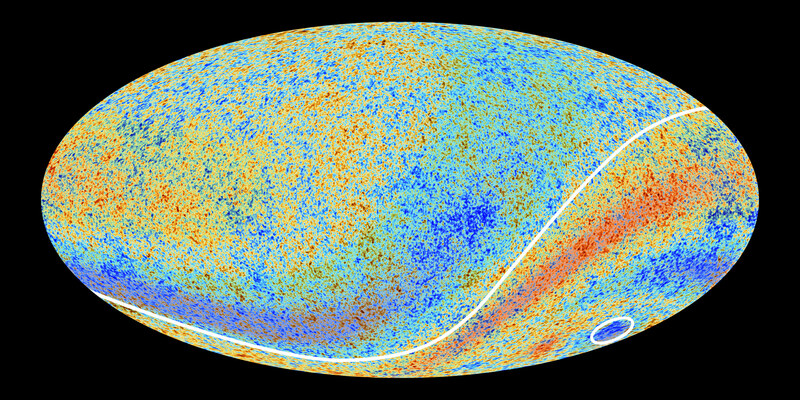 Instead of searching for imbalances in the microwave background, they looked for signs that space could have a preferred direction of expansion, and how these might imprint themselves on the CMB. Basically, their results showed that there is only a 1 in 121 000 chance that the Universe is anisotropic. In other words, the evidence indicates that the Universe has been expanding in all directions uniformly, thus removing any doubts about their being any actual sense of direction on the large-scale. And in a way, this is a bit disappointing, since a Universe that is not homogenous and the same in all directions would lead to a set of solutions to Einstein’s field equations. By themselves, these equations do not impose any symmetries on space time, but the Standard Model (of which they are part) does accept homogeneity as a sort of given. These solutions are known as the Bianchi models, which were proposed by Italian mathematician Luigi Bianchi in the late 19th century. These algebraic theories, which can be applied to three-dimensional spacetime, are obtained by being less restrictive, and thus allow for a Universe that is anisotropic. On the other hand, the study performed by Saadeh, Feeney, and their colleagues has shown that one of the main assumptions that our current cosmological models rest on is indeed correct. In so doing, they have also provided a much-needed sense of closer to a long-term debate. So the next time you find yourself looking up at the night sky, remember… that’s a luxury you have only while you’re standing on Earth. Out there, its a whole ‘nother ballgame! So enjoy this thing we call “direction” when and where you can. No Infinity in regard to the universe. We only measure and mark what we can see and study, and what we can see is only a finite amount of the whole. It is bigger still, and our lil corner of it may be nearer to the edge of its expanding horizon even though we don’t know it. As well, seeing that the natural form of everything in it takes the shape of a sphere or disc due to universal laws I’d be willing to bet the universe itself is a similar shape confined within the vault of the heavens. S0o, if it’s a disc then up and down can be relative to your universal position… up and down being the top and bottom of the disc and left, right, back, forward being at its rim. FYI, small but important typo: when you wrote “closer” I think you meant “closure” ? Up is a relative term, not an absolute term. Can’t apply relative terms to absolute situations. This has been known for several thousand years now. About time science caught up. I’m ready to defend, are you ready to disprove? The problem is that we do not have a technology good enough to measure the curvature of the universe accurately. In my opinion, the value is probably around 0.00002. We do not have any instruments that can get below 0.0001 with any real accuracy. The most likely scenario is that the universe is closed (Finite). My estimate is that if you travelled in your spaceship at Warp 18 Billion for about ten years, you would end up where you started. Fortunately, we can not do this, because if humans could, some hapless idiot would collide with a black hole in the centre of some galaxy. This would cause an energy release at least several times larger than the Big Bang. There is no infinity, and there is no edge. This is very hard to understand. That is why the model of ants running around on the surface of a balloon is used to try and explain the shape of the universe. The one dimension of the balloon surface represents what is called 3 dimensional space in the universe. There is no edge because if you are not in a universe, not only is there no space/time, there is no nothing. In a mathematical model, even the empty set would not exist. At this point the average person reaches brain meltdown. This shows the limitations of humans. We have a long way to go.